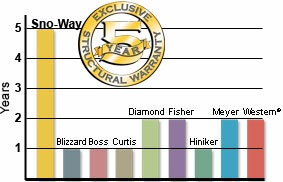 For the past ten years Sno-Way International, Inc. has focused on developing the very highest quality full line of snow plows. This included ten years of aggressive research and development, field and laboratory stress analysis, and continuous investment in our manufacturing capabilities. Western® is a registered trademark of Douglas Dynamics, L.L.C.